We often find that we could have easily avoided repeating an action if only we had paid more attention to getting it right at the first instance. I also find that the energy, the time and the mental stress of re-doing a task often leaves one feeling exasperated. In some cases, it totally destabilizes one’s itinerary for the rest of the day. I was given a task to do and the bottom line is I flunked it; the first time at least. I had the responsibility of extracting data from a bunch of already completed forms. With hindsight, it was apparent I hadn’t taken the time to be clear on the task or its final objective; It was also clear that I didn’t pause to ask questions when I hit a roadblock. Instead, I assumed I knew exactly what was expected of me or at least was bright enough to figure it out. So, I decided to act out my ability to work independently. I even as much as applauded myself on my ability to brainstorm and achieve much with so little assistance. The long and short of it is that I hadn’t extracted all the information that was needed from the forms, which left me having to begin the entire process all over. It cost me my lunch break, a headache and a whole lot of time and energy that could have easily gone into other things (like jotting down another blog idea). The lesson that could be learned from my experience boarders around how individuals can increase their effectiveness, not by doing more of the same things (especially when it’s the wrong way), but by striving to do the right thing, the first time, every time. In addition, I’ve also come to realize that one of the biggest mistakes we often make, a major factor of not doing things right, boils down to making ASSUMPTIONS. We assume we know what’s required, or we assume we know how to get it done or a variety of other assumptions -when it might be best to simply ‘ask’ and/or ‘clarify’. If we must remain effective as individuals, a conscious and continuous effort must be paid to ensuring a meticulous and a thorough eye towards performing tasks. Striving for precision and correctness (at the first instance) will result in resource savings. Likewise, the time and energy saved may be channeled into other productive activities, which will further translate into personal and organizational gains. It’s okay not knowing everything. There isn’t any harm in seeking clarification; it diminishes one in no way at all. Better wiser to have asked than enervated staying mute (I’d be sure to favourite this). Finally, priority should be given to the quality of work we do. It reflects on our personal brands. Presentation matters. Thoroughness should take precedence over speed, fatigue, laziness, disinterest and the likes. The fact remains; if we fail to give it a 100% at the first instance, it usually comes back with teeth sharp enough to rip. That in itself, I believe, is sufficient reason to be more effective. 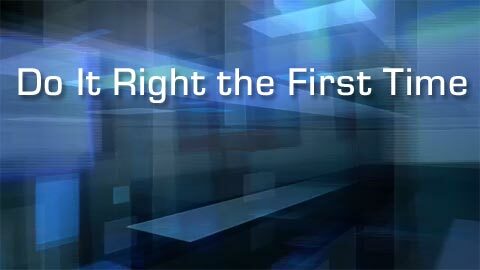 Doing it right the first time is not asking for perfection or suggesting we create an illusion of it. It’s more about taking the time to carry out our tasks as best as we possibly can, within the limits of current abilities and after we must have made the required effort to ensure that the objective is understood. Subsequently, if mistakes do arise, then we’re better off and stand to gain new knowledge which will set us in a better position to outperform on the next attempt.